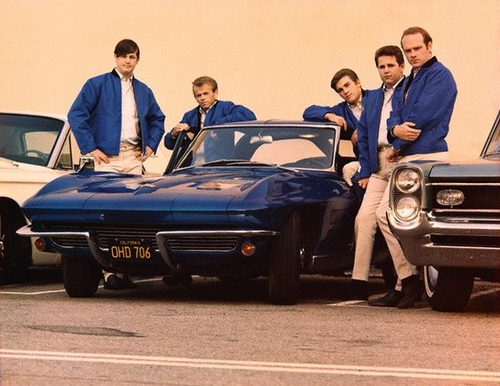 THE BEACH BOYS – LITTLE DEUCE COUPE: Harmony-Pop’s Custom Machine – Schlockmania! Little Deuce Coupe shouldn’t be as good as it actually is. For starters it was rushed out by Capitol Records a mere three weeks after Surfer Girl. That’s a reflection of how record companies expected their artists to pump out product quickly back then but it’s also a reflection of how little faith Capitol Records had in the longevity of the Beach Boys. 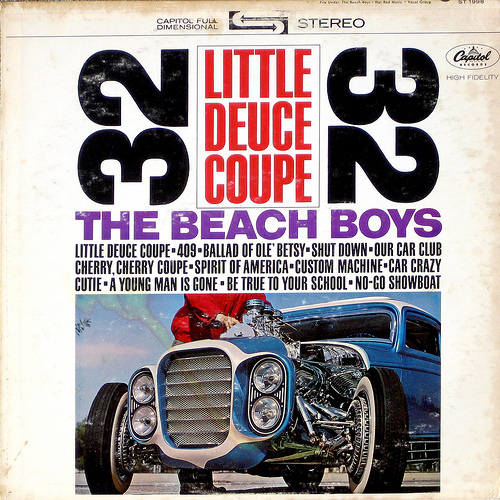 To make things even dicier, the speed of Little Deuce Coupe‘s release necessitated the recycling of no less than four songs from their prior three albums. That means the album is only 75% new material, a mere eight songs. However, the Beach Boys had something working in their favor despite these odds: they had Brian Wilson, who was finding his voice as songwriter and producer, masterminding the show. What he came up with is what some rock music fanatics consider to be the first concept album in rock and roll history, a stack of hymns to wonders of teenage car ownership. To Wilson’s credit, he manages to assemble an array of different styles and moods to keep his single theme fresh – and he even manages to add an unexpected bit of emotion into the mix. One listen to the album makes it clear that Wilson is still riding high on “kid in a candy store” thrill of being able to produce his own sessions. Every track here is tight, energetic and full of playful, inventive thrills. For example, Wilson has the group experiment with a rollicking, Dion & The Belmonts doo-wop style for “Car Crazy Cutie” and “Cherry, Cherry Coupe” works in a lot of vocal harmony experiments, like pitting a staccato lead vocal line against languid backing vocals during the verses and trotting out a variety of competing vocal lines at the chorus to create a sonic tapestry. It also helps that Wilson’s songwriting abilities were improving with each album. His main collaborator here is Roger Christian, a disc jockey and car enthusiast who adds the appropriate gear-head jargon into the lexicon of these songs. The lyrics these two come up with are often witty: “No-Go Showboat” discusses the phenomenon of great-looking car that has nothing going on under the hood and the aforementioned “Car Crazy Cutie” has some amusing couplets about a girl who is more turned on by cars than the guys driving them. They only stray once from their automotive mandate with “Be True To Your School” – and even that finds a way to work a mention of cruising into the mix. However, the big surprise here is that Wilson finds a way to work the emotionalism that would become a trademark of his songs into the mix here: “Ballad Of Old Betsy” is an unexpectedly heart-tugging tribute to a first car that’s on its last legs and “A Young Man Is Gone” weds new lyrics about James Dean’s untimely passing to the ghostly melody of “Their Hearts Were Full Of Spring.” The latter has a hymn-like beauty to it and Wilson’s choice to do it a-cappella makes it a beautiful venue for his knack with harmonies (and engineer Chuck Britz’s ability to capture them via good mic-ing). Along similar lines, “Spirit Of America” captures a sense of patriotic pride in its chronicle of real life jet-engine racer Craig Breedlove. Wilson achieves this via a stunningly beautiful melody with just the right amount of all-American swagger and the results are gorgeous and propulsive all at once. 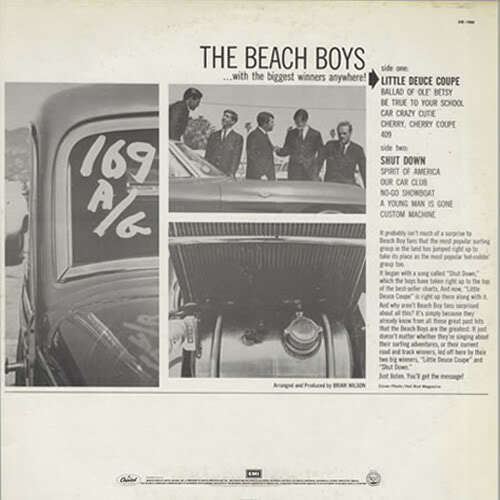 Finally, the album ends on a up-note with one of the great deep-catalog gems of the Beach Boys’ classic period, “Custom Machine.” This love song to a top-shelf automobile is short but densely-packed with harmonies and inventive musical twists in both the songwriting and arrangement. 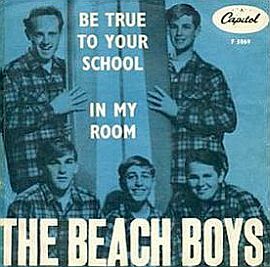 When the Beach Boys break out with a breathtaking bit of wordless vocal harmony to illustrate the car’s sound, one realizes that Wilson could just as well be talking about the Beach Boys when he was writing about his “custom machine.” He would provide them with even greater triumphs in the years ahead but Little Deuce Coupe remains an engaging and impressive piece of work that shows their skills were highly developed even at this early stage.